The European Commission has updated the CPMR’s member regions on the first part of the EU’s new mobility package, designed to modernise European mobility and transport. 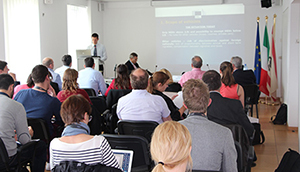 Peter Szatmari, Policy Officer at the European Commission’s Directorate-General for Mobility and Transport (DG Move), presented the plans at the latest meeting of the CPMR’S Transport Working Group, held in Brussels on 6 June. The package, which was announced by the Commission on 31 May, includes a proposal to revise the Eurovignette Directive of 17 June 1999 on taxing heavy goods vehicles for the use of certain infrastructures. Most EU countries collect user charges from road hauliers for the use of their transport infrastructure, which mainly involves roads. The EU introduced the Eurovignette to recover the costs of construction, maintenance, repair and environmental protection, as well as to ensure fair competition and avoid discrimination. It harmonises the conditions under which national authorities may impose taxes, tolls and user charges on goods carried by road. The Directive provides a framework for taxing the use of road infrastructure and is of the utmost importance for the peripheral regions, as it can affect the transport costs borne by the economies of these regions. It is therefore worth keeping a watchful eye on it for the CPMR. The 6 June meeting provided the opportunity for the CPMR and its regions to have an initial exchange of views with the regional transport official, prior to the CPMR developing any positions on this subject.